japanese, miniatures, miniature, dollhouse, toys, glico, time slip, retro sewing machine. YOU WILL ONLY RECEIVE NEW ITEMS WITH A BOX. THE OUTER BOX HAS HANDLING WEAR AND IS CREASED. THE PIECES ARE NOT IN THE ORIGINAL SEALED PLASTIC PACKAGING. PLEASE NOTE BEFORE PURCHASING: THE INFO CARD IS WRINKLED. 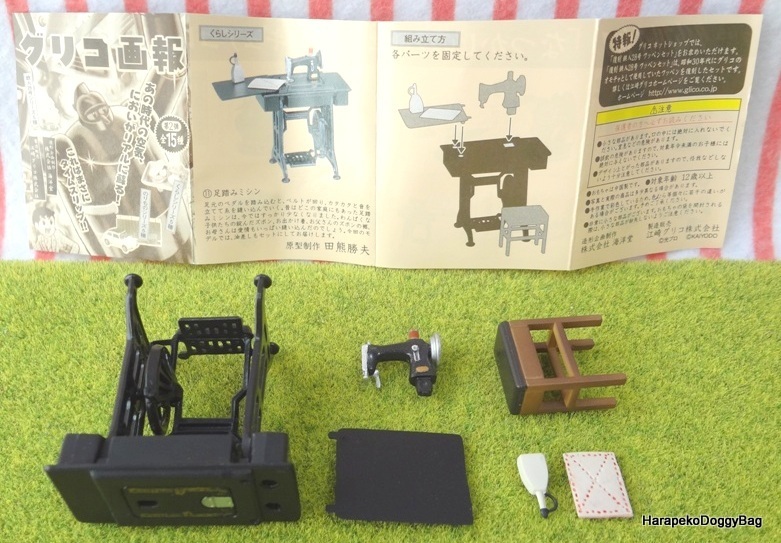 Here is a miniature retro treadle sewing machine set. Keywords: japanese, miniatures, miniature, dollhouse, toys, glico, time slip, retro sewing machine.